It’s official—it’s SUMMER! We should be in Hawaii; doesn’t that sound nice? Ahhh, I can see it now . . . a cold Mai Tai in my hand, lei around my neck, and some Hawaiian macaroni salad on my plate (very picturesque). Now macaroni salad may not epitomize tropical, but it sure does taste good. Instead of flying all of the way there for noodles, we’re going to bring this dish home. It’s simple, classic, and perfect for summer barbecuing (and you don’t want to show-up at the neighbors come 4th of July, empty-handed). Though I would be content having this solo, let’s make a meal out of it, and we’ll do it tonight! We’re going to serve this alongside some easy, Sweet Hawaiian, BBQ Chicken Sliders. For this dish we’ll start off baking seasoned chicken breasts in the oven, and then transfer over to our crock pot to do the rest. The salad is as simple as boiling noodles and chopping stuff up, that’s it. Hot weather, festive eats, and we don’t have to attempt roasting a 50-lb Kalua pig ourselves? Show me to the hammock! I hope the term ‘macaroni salad’ isn’t dissuading you. I do NOT mean the mystery variety you find pre-made, at your grocer’s deli—blechh. No mustard, no deplorable sweet relish, not on my watch! This is more like the L&L Hawaiian BBQ restaurant-style side. I’ve adapted mine to include light sour cream, so we use less mayo. I add ginger, green onion, carrot, and some celery for texture. It’s simple, and it goes swimmingly alongside our shredded BBQ chicken (on sweet Hawaiian buns). Island? Who needs an island? Let’s get the oven preheated, slice a pineapple (You grabbed one right? ), and cue-up some Israel Kamakawiwo’ole on the iPod. That’s more like it. 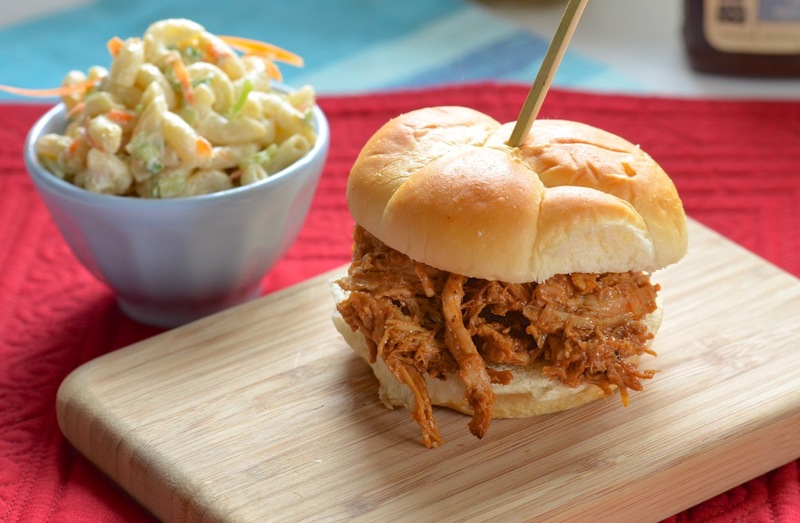 The Islands come to you with a super simple, summer macaroni salad, and shredded BBQ slider. Perfect for a long holiday like 4th of July, or the end to a long week. Serves: 2 chicken breasts, ~5 smaller sliders. 2 large chicken breasts, bone-in with skin (you can do 4 chicken breasts for larger family). Rinse & pat dry chicken breasts (they should be very large bone-in breasts, 2 came in my package). Place in small casserole dish or 9x9, or bigger for more chicken breasts. Pour over the prepared Italian dressing, to coat above and below in dish. Wrap top loosely with foil, and back on 325 for 30 minutes. Remove foil and raise temp to 350, continue to bake until chicken is done (mine took over 1.5 hrs since they were very large). Once cooked completely through, remove chicken from oven and let cool, enough to handle/shred, reserving juices that collected in dish. Shred cooled chicken breasts discarding all bones, skin and cartilage. Put shredded meat into small crock pot on warm, adding ~1/2 the bottle of BBQ sauce and about ¼ cup of the collected chicken juices from baking dish (skimming off fat first). Add salt and pepper and let sit on low until ready to eat (stirring occasionally). Serve them on lightly warmed Sweet Hawaiian brand hamburger buns, with slaw on sandwich as desired. Boil one 1-lb package/box of small, elbow macaroni noodles til al dente. Drain, rinse with warm water, and let completely drain in colander again. In large mixing bowl combine noodles, chopped celery, green onion, confetti-cut carrots, minced garlic, lemon zest, paprika, ginger, salt, pepper, Worcestershire, well. Add sour cream, mayo and Italian dressing, combining thoroughly. Refrigerate to set, until ready to serve; serve cold. Enjoy alongside the sweet chicken sliders! Serving size: a slider and some macaroni! Easy enough. The shredded chicken is simple, and doesn’t need much other than the tangy, Hickory Smoke BBQ sauce. It is kind of like a Hawaiian Sloppy Joe. As per our Aloha Salad, I prefer mine not overly-saturated with the mayo/sour cream, though I know traditionally a lot more is used. I find my recipe is still creamy, and I don’t miss it, but you can easily add more as you please. I was inspired to make this as a practice for an upcoming Hawaiian-themed, summer BBQ—I think it will be the perfect potluck dish (well, maybe second to the Mai Tais, but still). Give this one a try when you need something fast. It’s a kid-friendly recipe, with few ingredients, so it works for most weeknights, especially if you cook the chicken ahead. Enjoy the warmer days, and lighter dishes! I’m going to go enjoy a slider. . . .